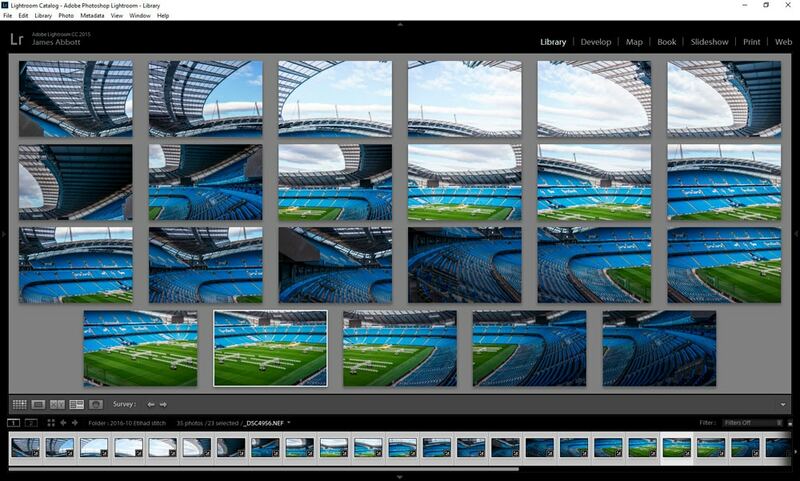 On a recent visit to the Etihad Stadium – the home of Manchester City, I shot an high-resolution image of the venue. This image is made up of 23 individual images so the full-size version is huge at 20877 x 7419 pixels. The physical size of this is an incredible 177 x 63cm. To make the image work online it had to be saved for web and cruched down a lot. To view the full-size image scroll down and click on the image. Below are the 23 individual images that make up the final high-resolution panoramic image. They were shot handheld with a 50mm lens on the camera. 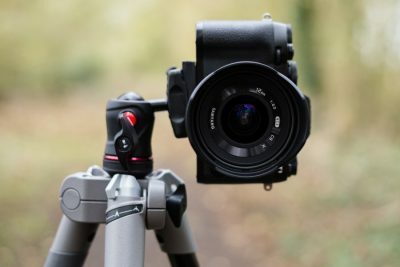 This was set to manual mode with the aperture at f/11 to take advantage of the best image quality the lens can produce. This also provided a large enough depth-of-field to get everything nice and sharp. Once all the images were downloaded onto my computer I processed them in Lightroom and then merged them together in Photoshop. Despite the level of detail Photoshop did an excellent job of blending the images, and I’ve not noticed any glitches. Even with a powerful computer it took roughly 5-10 minutes for Photoshop to complete the merge. These types of images always take a while to process, and this becomes increasingly apparent when you create a panoramic shot made up of over 10 individual frames. However, it’s always worth shooting as many as you need because you can always do something else while Photoshop does all the hard work for you. Click on the image below to see this ultra high-resolution shot of the Etihad Stadium its all its glory. It really is quite large so it may take a few moments to load – and it’s not even the highest quality it could be! It’s certainly an impressive stadium. I was there to shoot video of conferences and take stills, but grabbed this when I had a moment. Don’t blame you. I’d have done the same, but when I go there, the stewards wouldn’t be too chuffed if I did after a match! Great shot.